The GUI of ZevenOS is based on a custom theme for the Xfce DE. I have a little experience with BeOS and some of its clones, and I confirm that, from the outset, it does look quite like BeOS. 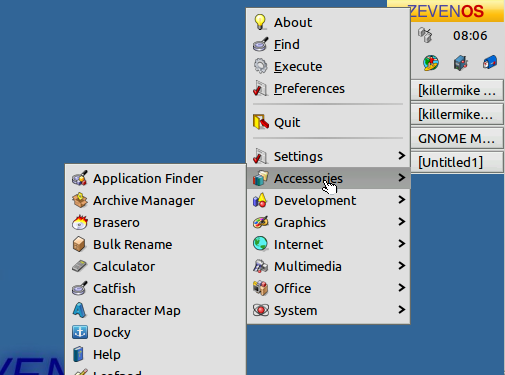 Naturally, the most famous element of the BeOS user interface, the small yellow title bar, has been retained. As with the original BeOS, the dock is located in the top right hand side of the screen and expands vertically. You bring it to the front by touching the right hand corner of screen, and when clicked on, it pops up an application launcher. ZevenOS recreates the BeOS dock. ZevenOS comes with some software that has been specially written for it. Magi and Magi 2 are, respectively, system information and configuration tools that are unique to ZevenOS. Beyond that, the default application choice, like parent distro Xubuntu, tends towards lighter weight options such as Abiword and Gnumeric. Naturally, you can add any applications that you could add to any other Ubuntu system. The custom settings and system info apps are quite impressive. There is also another variation called ZevenOS-Neptune that uses Debian Testing with a more recent kernel and KDE4 as the front end. When summing up, I'm a little bit torn. The cosmetic and user interface differences do evoke some of the feel of a mid-90s OS that looks like BeOS. Whether you like it or not will probably come down to your personal tastes. I've seen a lot of attempts to re-implement earlier operating systems come and go over the years, and one of the main problems was that the developers expended resources recreating components that already existed in the free software world, such as the kernel. It's admirable that ZevenOS tries to offer up some of the BeOS feel while reusing the Linux infrastructure wherever possible. Being a Linux distro also means that it has a complete set of well-maintained applications available to it. However, BeOS itself was more than just a front-end and included features such as a database driven file system that the applications themselves were able to take advantage of. As engaging as the illusion that ZevenOS offers may be, it is, after all, largely Xubuntu with a different theme on top of it. On the positive side, you're in fairly safe hands as it is still an Ubuntu variant, and if you like the look of it, it's a slick system that makes efficient use of resources. Although slightly out of date, the FAQ gives a full account of what the aims of the project are. Haiku is an attempt to create a BeOS compatible operating system from the ground up.